The Queen of the Lakes was originally a 2-masted schooner built in 1853 and later refitted with a 3rd mast in 1887. The ship sank with no lives lost in 1906. For 103 years she sat silently on the bottom of Lake Ontario before shipwreck explorers Jim Kennard and Dan Scoville located her using side scan sonar technology. The duo would later visit the wreck with a remotely operated vehicle (ROV) in 2011. In November of 2017 I had the opportunity to make the first dive into the upstream sump of Rich Creek Cave in Monroe County, West Virginia. 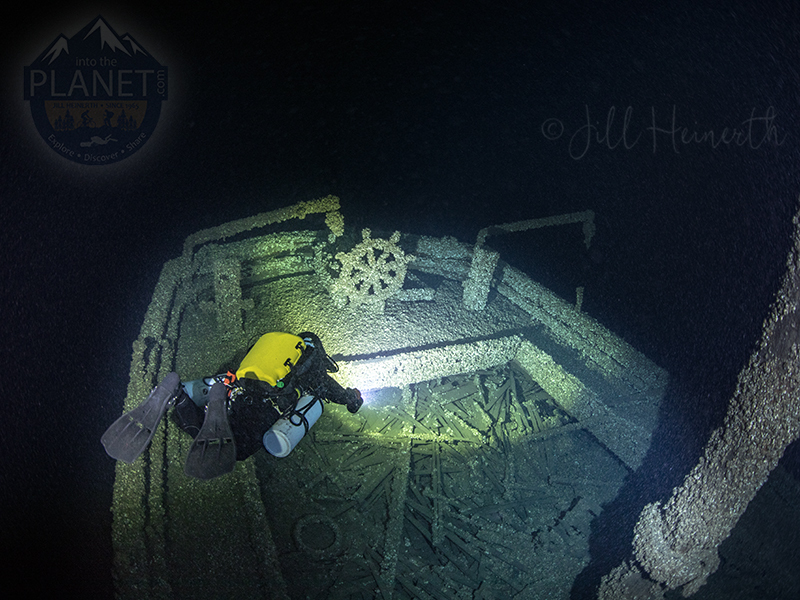 On the dive I explored 270′ of large passage, ending in an ascending breakdown passage. I attempted to return in June of 2018 but unfortunately the low-airspace entrance to the cave was completely sumped. 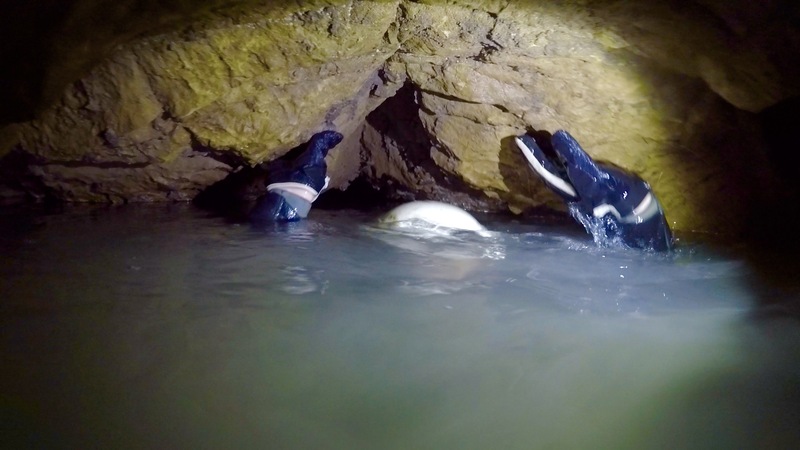 After some failed attempts at freediving the short entrance sump we abandoned efforts and went caving elsewhere. The SUOC Sumpeaters preparing for our September 7th dive. Photo Jon Lillestolen. In September of 2018 I had the opportunity to return and pick up where I had left off. Joining me for this two-day effort was Jon Lillestolen, Nathan Roser, Joey O’Reilly and Tyler Baldino. Nick Shaer met us on-site and gave us the latest dye tracing and mapping efforts in the area. Conditions were great in the cave and we made it to the sump in about a half hour. Another half hour later and I was ready to set off into the sump, prepped for big passage with two LP95’s filled to 3700psi each. I had a lot of gas. The sump descends abruptly before first leveling off at 20′ and then again at 55′. As I arrived at the 20′ level I was disappointed to see my guideline had been severed since I was last in there. I made a repair and tied in a new reel. Turning back towards the sump entrance I began ascended, thinking I had missed the way on last year. I continued up until (to my surprise) I surfaced in a large air chamber. I swam to one end and didn’t see a continuation. Coming back the other way I swam to the far end and after going under a “duck under” I was in a continuation of the room. The bottom of this room had deep water as well, and I figured this would present another diving lead. After running some line through the room I left the reel ready to go for the next day’s effort and returned into the sump. I had intended on trying to re-line my previous dive lead but instead exited due to cold and low visibility. We left my tanks and dive gear in the cave and took off for the Bat Ranch where we enjoyed a nice evening with the VPI Cave Club. On Saturday we returned to the cave. Jon Lillestolen was to dive with me and had packed his Disto and some LP50’s for the short commute through the sump to this new air chamber. While Jon assembled his gear I set off alone with camera in hand to get some “good vis” footage of the sump before we started working in it. I also went back to the dive lead at the far end of the new room and moved my reel another 30′ into that lead before realizing I had no zip-ties readily available to secure the line to my silt-stake. I decided to just leave the reel there, I’ll be back soon enough and will just pick it up and go! This lead is trending back towards the entrance to the sump and there was no discernible flow. I suspect it may just be part of a large room to which the air chamber is the top, and the bottom is where I had come from (just 100′ over). Jon was in the air chamber by the time I made it back. We found a good ledge to stow the gear and took our tanks off. More mobile with less equipment, we spent about 2hrs surveying and exploring the new air chamber. Jon made a scramble up one part of the room but soon had to abandon efforts due to passage size. A notable feature of this room- we could hear the sherpas from the entrance of the sump! Someone will need to do some climbing and confirm this connection. When Jon and I were done surveying we dove out in some pretty low visibility and exited the cave. Teddy Garlock (trying to) use a Disto to help Jon Lillestolen with his survey work. Photo Jon Lillestolen. Teddy Garlock in the air chamber. To his right is the “duck under” that leads to the main part of the room. Photo Jon Lillestolen. Jon at the EOL leading into the air chamber. Photo Teddy Garlock. Special thank you to our sherpas who carried gear: Nathan Roser, Joey O’Reilly and Tyler Baldino. Special special thank you to Jon Lillestolen for showing me the simple side of dry cave survey! With permission from some incredibly supportive landowners, we scheduled a dive for November 18th. Present for the trip was Nathan Roser, Joey O’Reilly, Tyler Baldino and myself as the sump diver. Nick Schaer joined up with us for the morning and provided a wealth of information related to the endeavor. The sherpa/dive team. From left to right: Nick Schaer, Nathan Roser, Teddy Garlock, Tyler Baldino, Joey O’Reilly. Not pictured but present: Sheck the dog. 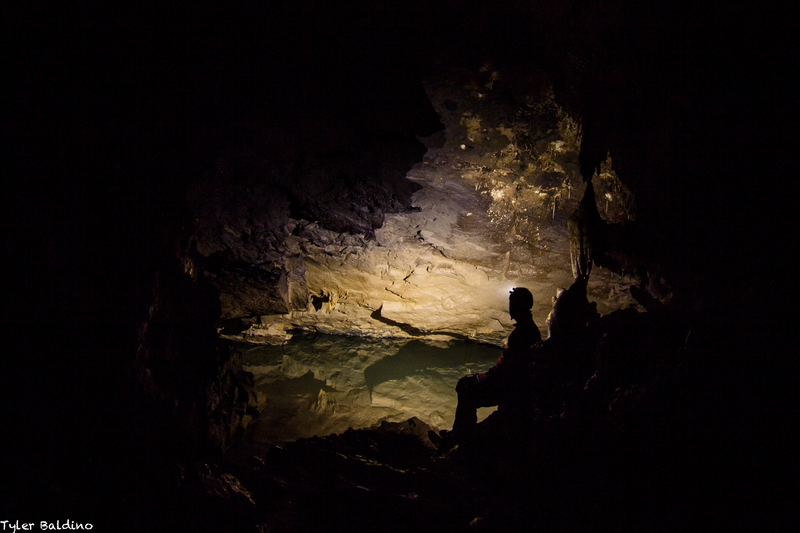 The cave starts out with an ear-dipper in some cold (but warmer than NY!) running water. Airspace is less than 4″, requiring either a nose-up traverse or my preferred method of full submersion with a quick swim to the other side. I was wearing my drysuit during the commute to the sump, so I’m not sure why the other guys were complaining so much… I was toasty! Teddy going through the entrance “ear dipper”. Tyler Baldino goes through the ear-dipper, electing to utilize the “all in and all under” approach. 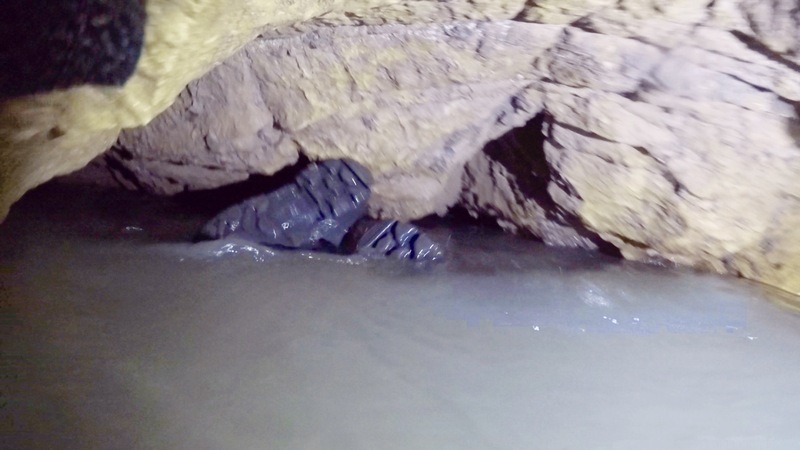 The cave was mostly wet, with several swims required. There was plenty of scrambling over massive breakdown but no crawling required. I did the trip wearing my CF200 neoprene drysuit and didn’t regret it a bit. We stopped along the way and took lots of photos, but easily made it to the sump within an hour. Without pausing I think this could be a 20 minute trip. The water is cold and I suggest any sherpas on future trips wear a full wetsuit, or even a drysuit if available. Along our commute to the sump we paused several times to enjoy some extremely well decorated passages. This is in “The Unexpected Room”. The Sumpeaters enjoying the beautiful passage in Rich Creek Cave. From left to right: Tyler Baldino, Nathan Roser, Teddy Garlock and Joey O’Reilly. Teddy Garlock enjoying a relaxing drift down the water-floored passage. 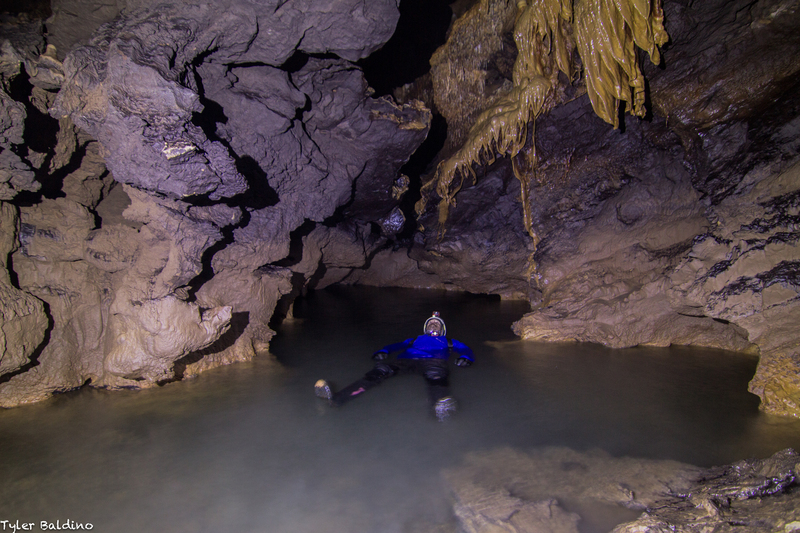 Caving in a drysuit is NICE!! When we arrived at the sump I began preparations for my dive. 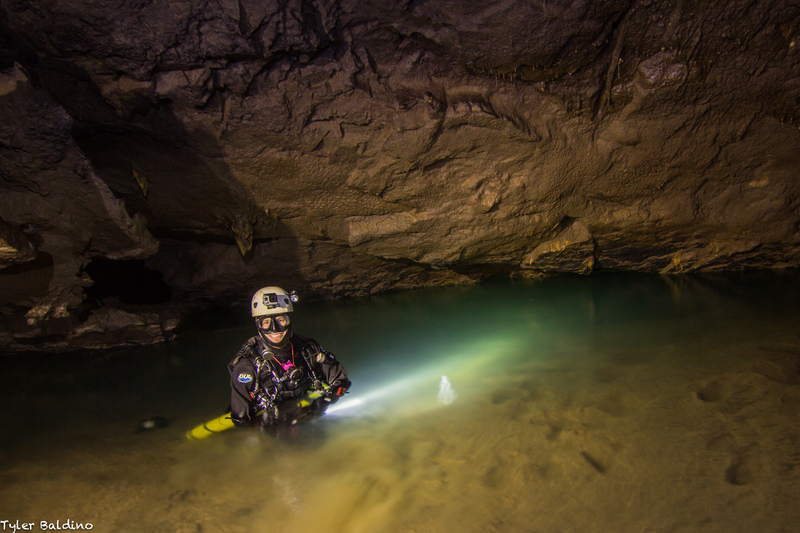 Due to the sump’s size and discharge rate I brought along two cave-filled LP45’s along with a bright canister light and associated cave diving gear. For surveying I used a compass and slate, leaving my mNemo at the start of the sump for use after I had obtained some solid survey data. 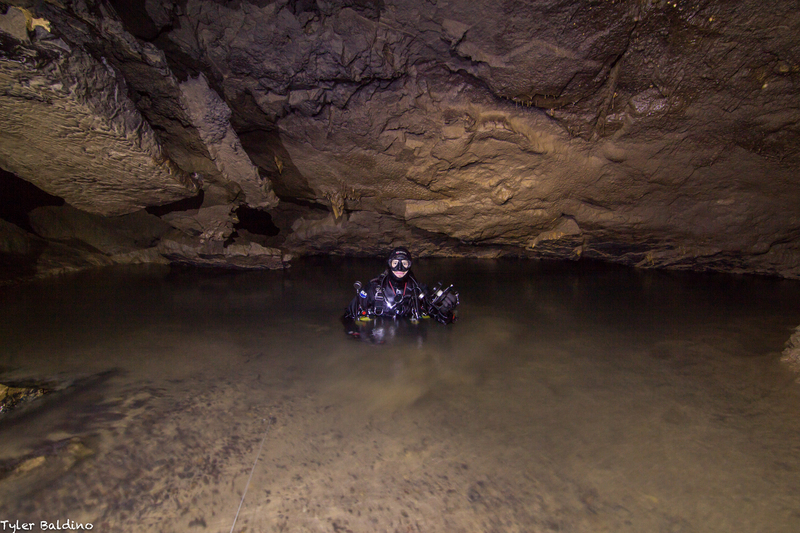 Teddy Garlock before diving the Rich Creek Cave sump. The start of the sump was approximately 20′ wide and had a floor-to-ceiling height of around 4′ at the entrance. There was a lot of flow, quickly washing away any silt that I stirred up. I tied off to a large rock and set off, descending down the mud/bedrock slope. I couldn’t see both sides of the passage, so I hugged the left wall. I made several tie-offs on the wall as I went, until the passage finally leveled out at 55′ depth. At that point I couldn’t see the right wall or even the ceiling, so I made a guess and continued straight through what I figured was the middle. I came across a large chert projection from the ceiling, tied off and went right. I found a passage trending up through some large breakdown with slight flow. Following this passage I went up to a depth of 43′ and could still see the passage rising. I paused to evaluate flow and noted it was present but much less than I would expect due to it’s decreased size compared to the rest of the passage. I tied off and surveyed on the way out, surveying 270′ of passage at 10 stations. I returned to the entrance and ditched some of my gear, including my large explorer reel and GoPro. I returned to the ceiling projection and tied off another reel, this time heading left to see if I had missed the way on. Unfortunately I didn’t find any new leads, and the decreased flow in this area quickly reduced visibility to near-zero. The EOL could be pushed through that breakdown, but my gut tells me I missed something much bigger and likely the way on. On the next dive (be it me or some other sump diver), I would suggest tying off to the ceiling projection and making a 90° right turn into the abyss. If that doesn’t go, try going “up” from around that area. If all else fails, get back on my line and follow it to the end. Tie-off and scoop that passage! Nathan waiting for Teddy Garlock to return from his dive in the sump. Teddy Garlock after returning from surveying 270′ of BIG, virgin sump passage. 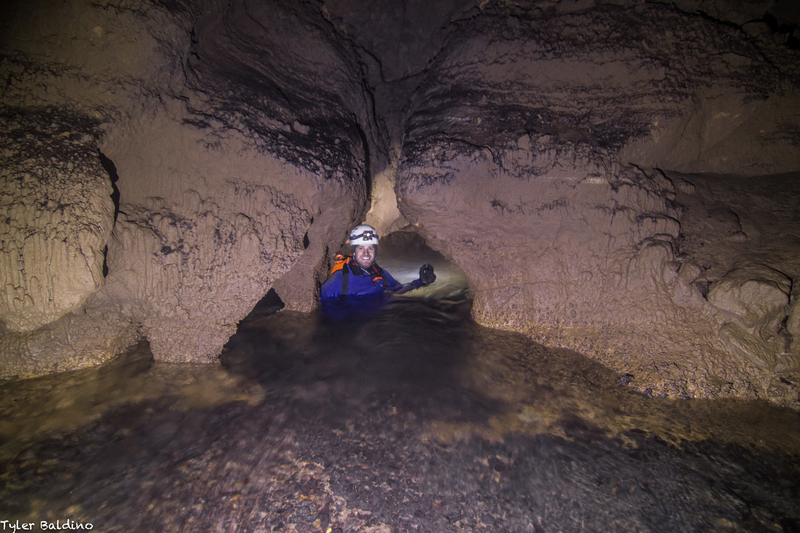 Teddy Garlock in the Rich Creek Cave sump. The entrance to a small side-lead that soon ends in a sump. The sump is short, with a small room beyond. After I finished exploring the side lead we packed up my gear and headed out. We emerged from the cave about 4.5hrs after entering, cold but extremely happy with what we had accomplished for the day. After packing up we went to Norman Cave in Greenbrier County, then ate burritos and finally arrived back at WVACS around 10pm. The SUOC Sumpeaters after a successful dive in Rich Creek Cave. 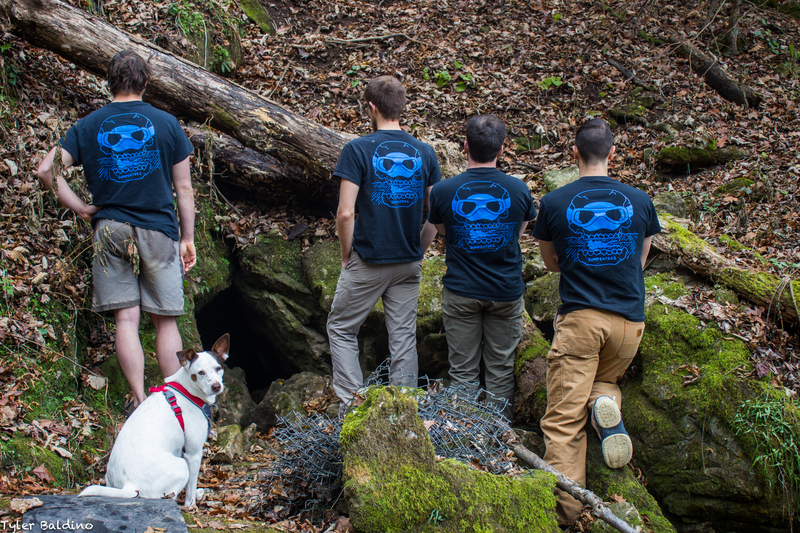 From left to right: Joey O’Reilly, Nathan Roser, Teddy Garlock, Tyler Baldino, Sheck the dog. SUOC Sumpeaters at the entrance to Rich Creek Cave. One of these days we’ll get Sheck a shirt. 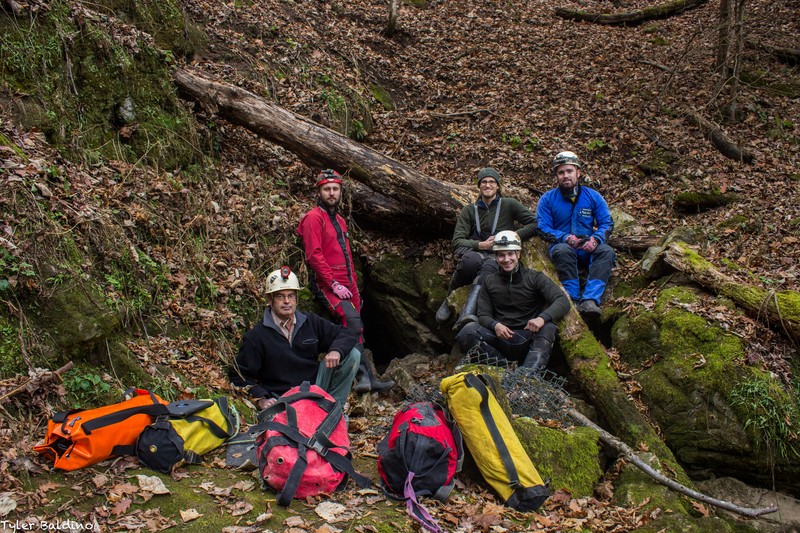 A sincere thank you to the landowners for allowing exploration in their cave, Nick Schaer for all the beta, WVACS for the lodging and Nathan/Joey/Tyler for helping sherpa gear. 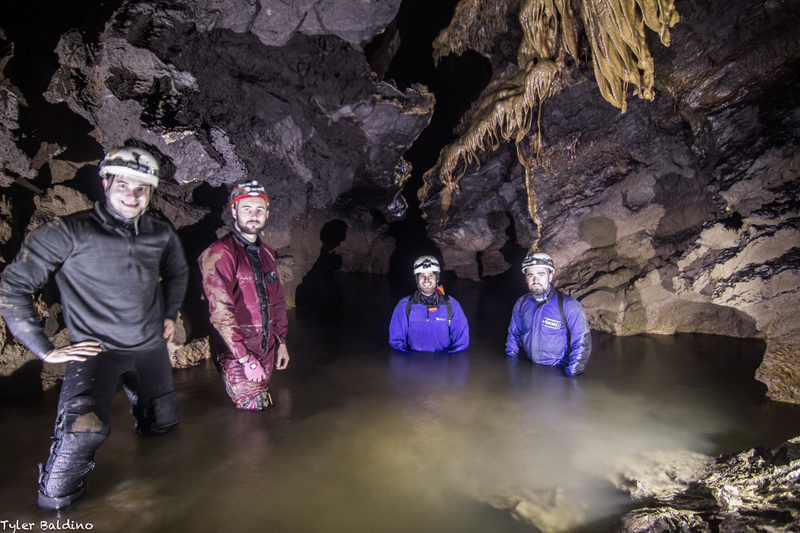 A special thank you to Tyler for bringing his DSLR setup through all that water and cave passage to bring us back some very beautiful pictures. 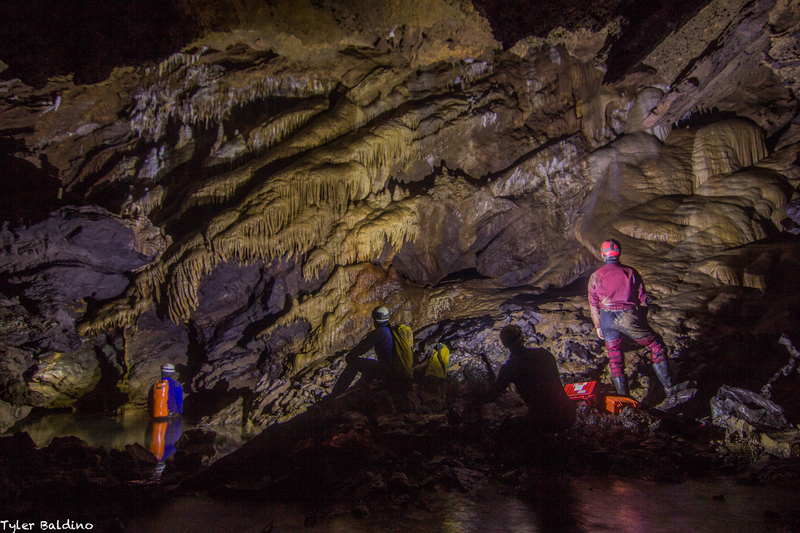 On June 3rd we returned to make an attempt at the sump in Doolittles Cave. As eluded to in my precious post, the cave is fed from a pond on a large pond. The water in June was REALLY warm, making for an incredibly smelly and all around nasty endeavor. Accompanying me on the trip were Nathan, Joey, Tree, Trenton and Garrett. My sherpa team, from left to right: Nathan, Joey, Tree, Trenton and Garrett. Our commute to the sump was uneventful. We rigged a cable ladder for the drop and all managed to safely descend despite the drastically increased water flow. I geared up at the bottom of the waterfall and we all started towards the sump. Lacking in anything to tie into, I utilized Nathan’s leg as the nearest immovable object and wriggled my way backwards into the foamy abyss. 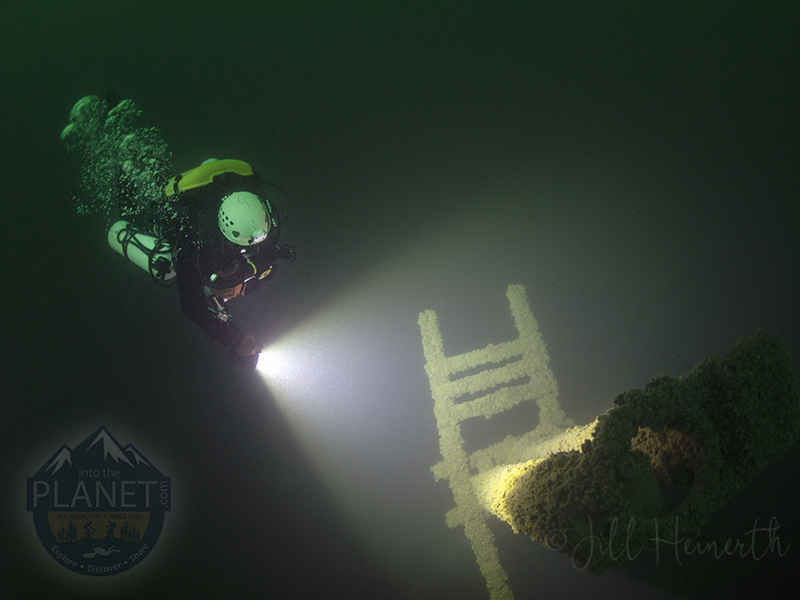 Water visibility was a solid 0′, I could barely even make out the glow of my dive light when shined in my face. I was sidemounting 45’s and using no fins, using my feet to feel along the bottom and negotiate the way on. After descending at nearly a 45° for about 30′ of penetration (and at a depth of 12′) I felt the passage level out. The passage remained a fissure, but only the belled-out bottom was actually wide enough for my body to fit through. Using my feet as a gauge, I estimated the dimensions of where it had leveled out to be about 18″ tall and around the same width. I likely could fit through in a wetsuit and dragging a tank behind me, but no thanks. This passage is far too choked up with mud and debris to make it a worthwhile endeavor. I reeled in my line and we started towards the exit. That night all of my equipment got a nice bath in some germicidal disinfectant. A fun trip, but not doing that again! Teddy at the entrance to the sump. NASTY. Teddy “washes off” in the farm-pond runoff.